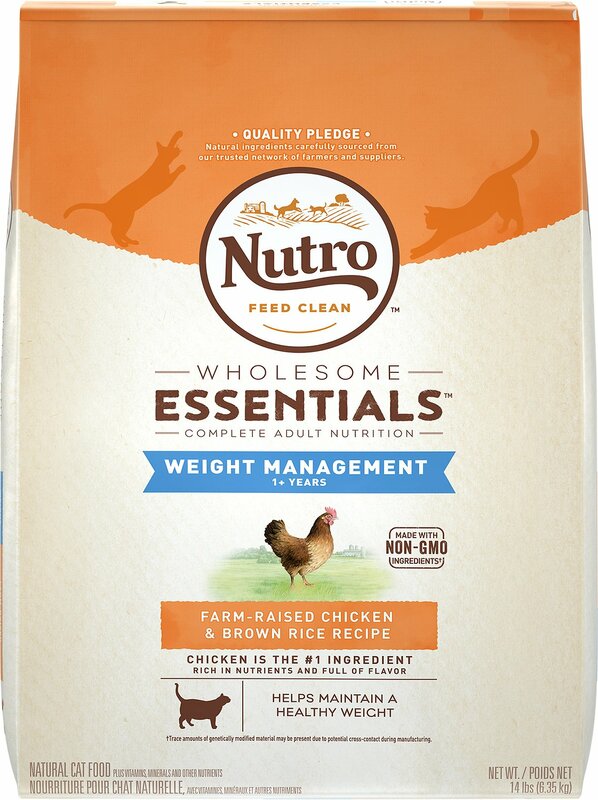 Give your kitty the wholesome goodness he craves without the extra calories found in Nutro Wholesome Essentials Weight Management Adult Farm-Raised Chicken & Brown Rice Recipe Dry Cat Food. 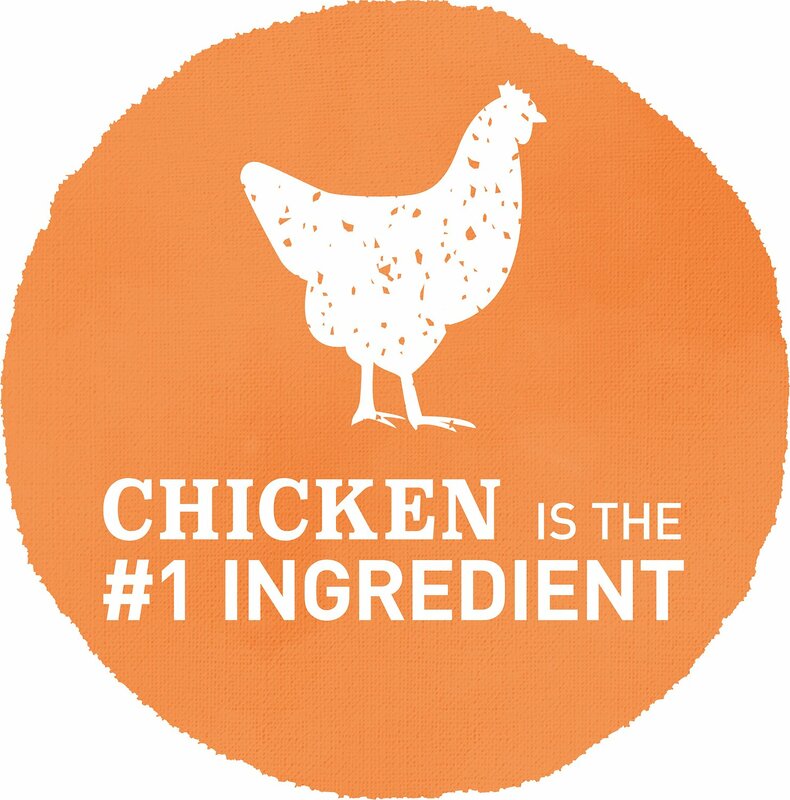 Made with real chicken as the first ingredient and fewer calories and fat, it’s clean nutrition in every bite to help your pal get to an ideal weight. It’s also packed with everything he needs to look and feel his best, like antioxidants for healthy immunity, fiber for healthy digestion, and essential taurine for eye health. Plus, you won’t find any GMOs, or anything artificial, which means you can feel good about pouring it on. Made with real, farm-raised chicken as the first ingredient, plus 28% less fat and 13% fewer calories to help maintain your adult cat's healthy weight. 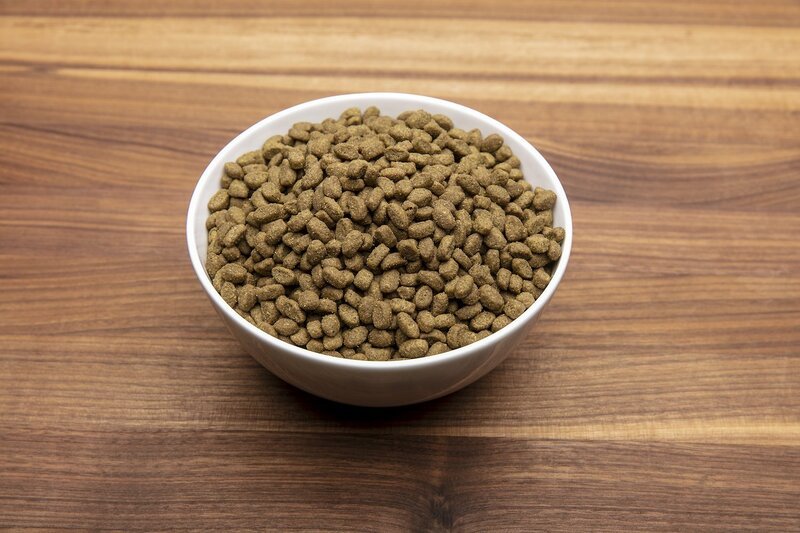 Nutrient-packed and flavor-loaded so it provides a balanced and complete diet for overweight cats and satisfies even picky eaters. Fortified with vitamins, minerals and antioxidants for immunity, fiber for a healthy digestion and taurine for eye health. 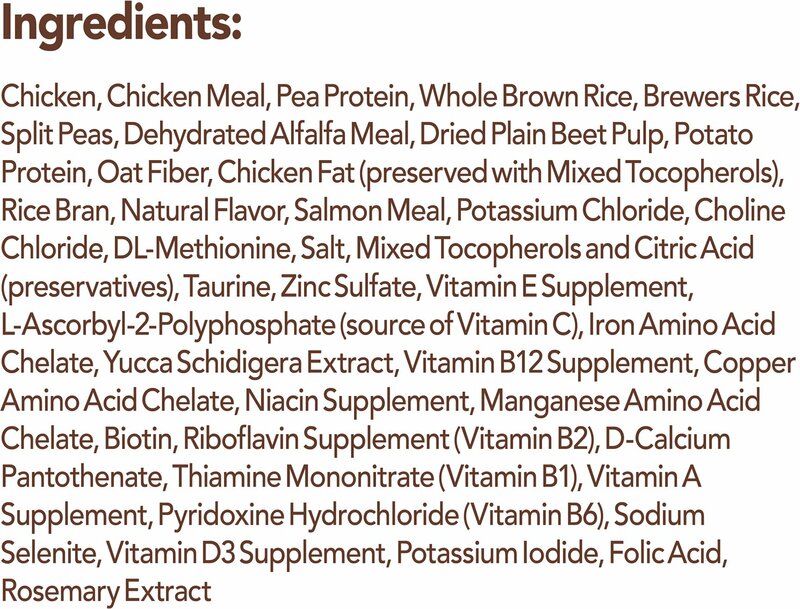 Old Recipe: Chicken, Pea Protein, Brewers Rice, Chicken Meal, Whole Brown Rice, Peas, Dehydrated Alfalfa Meal, Oat Fiber, Potato Protein, Dried Plain Beet Pulp, Flaxseed, Chicken Fat (Preserved with Mixed Tocopherols), Natural Flavors, Rice Bran, Salmon Meal, Potassium Chloride, Choline Chloride, Dl-Methionine, Salt, Taurine, Vitamin E Supplement, Zinc Sulfate, L-Ascorbyl-2-Polyphosphate (Source of Vitamin C), Iron Amino Acid Chelate, Yucca Schidigera Extract, Vitamin B12 Supplement, Copper Amino Acid Chelate, Niacin Supplement, Sodium Selenite, Manganese Amino Acid Chelate, Biotin, Riboflavin Supplement (Vitamin B2), Calcium Pantothenate, Potassium Iodide, Thiamine Mononitrate (Vitamin B1), Vitamin A Supplement, Pyridoxine Hydrochloride (Vitamin B6), Vitamin D3 Supplement, Folic Acid, Rosemary Extract, Decaffeinated Green Tea Extract, Spearmint Extract. My picky little girl who literally only likes her brothers kitten food and this . She is getting a little more to love on the kitten food so I tried this . I am mixing it currently with the Indoor version of this as she loves that even more but I’ll fully transition to this . If you have a picky eater try this . It is really a healthy one too . I really hope Nutro never stops making this formula or my Daisy will have a meltdown .. haha ! Ingredient list looks great, so I tried this. Pieces are large for the tiny dogs I have, and NONE of my dogs liked this. Some would eat it, but most would push it out to get to the other brand that it was mixed with. I won't buy it again. I've had my cat eating this for a few months, first time ordering from Chewy. She has lost weight and likes it. 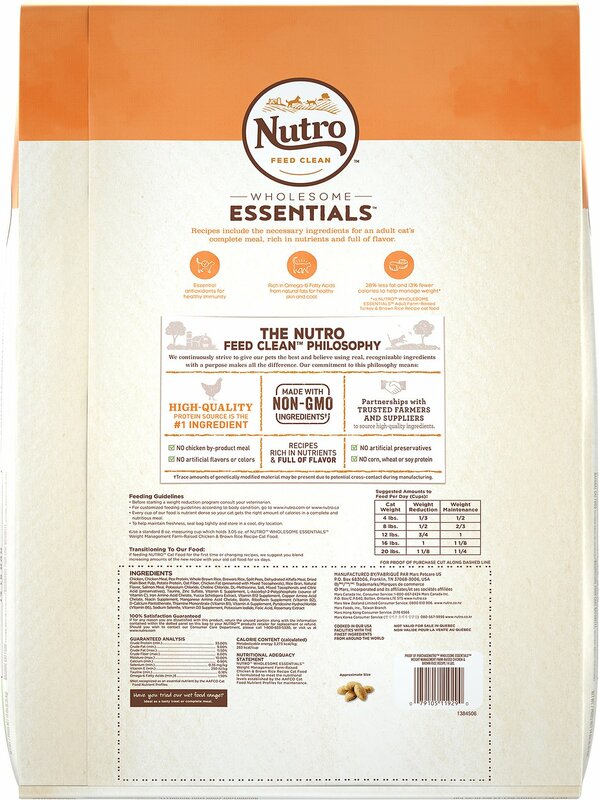 Nutro is a very good line, with chicken being the first ingredient listed, which is important to me and the health of my cat. Delivered at lightening speed! Highly recommend it and Chewy. My cats love it, and now they are getting grains back in their diet. Easy transition from previous brand of weight loss/management food. Very good for overweight cats. I have 3 overweight cats & several more thin ones. 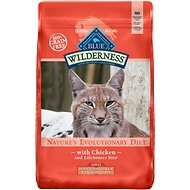 All seem to like this & eat it, but 1 overweight cat still likes her other dry food which has more calories & fat, but eats this also. Nutro has very good limited ingredients in this dry food. The best weight control dry cat food I've ever found. Sampson waits for his Nutro "crunchies" after he finishes his wet food. Part of his routine, satisfied he then goes off somewhere to snooze. If he could talk........hmmmmm he does in fact yowls until he gets the Nutro. 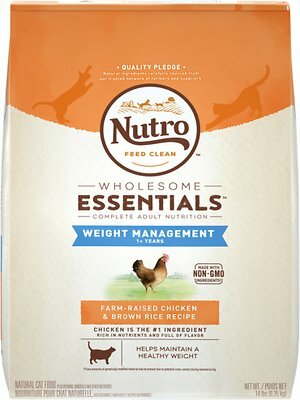 All my cats have lost weight eating this product and Nutro is all we use for our beloved feline friends. Chewy is a great site to order outback nutro through and I’m very satisfied. Thanks Chewy!! My cat snarfed it right up. I do and she is always hungry. I started giving her a small portion of this Nutro Weight Management when she gets persistent. She likes it and eats it. I think I can see a slight weight loss.She is 12 yrs. old and extra weight isn't healthy for her. This food is exactly what I need for my hedgehog. He tends to be a little on the tubby side, so weight management is key. Also, the 3 pound bag is ideal for 6 month auto ship since he eats just a tablespoon a day.